Views from the walls in Purin, Slovenia. The market at Stari Trg, close by sleek bars and trendy shops. 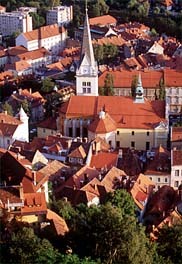 View of the red-tiled roofs of Ljubljana, capital of Slovenia, from Ljubljana Castle. Standing in the turret of a hilltop castle, leaning with a sigh of bliss against a stone parapet, I took in the old part of the city: curving cobblestone alleys and avenues; a dark river that traced a slender crease between centuries-old buildings; handsome plazas with statues and fountains; a patchwork of red-tiled roofs. I could have been in Italy, or maybe even France. Looking into the distance, toward the horizon, I saw verdant hills rise into the continent's most majestic mountains: the stony, vertiginous Alps. I could have been in Austria, or maybe even Switzerland. But there was something wrong with this picture — something different, something missing. Only two other tourists stood beside me, there were precious few below me, and I was not feeling nervous about the money I was spending, because everything was relatively cheap: the restaurants, the hotels, the taxis, the trinkets. These were the welcome, telltale signs that I was in another, less traveled country, an arguably more hospitable place. I had come to Slovenia — yes, Slovenia. If you do not really know where it is or what it is or why someone might linger there, you may be comforted somewhat (although not, I would bet, all that much) to learn that President Bush, until recently, was in the same boat. During the presidential campaign, he rather famously confused Slovenia with Slovakia, an altogether different place. And yet Slovenia ended up being the fifth and last country Bush visited on his first overseas trip as president in June. I arrived with him — and then, my curiosity piqued, stayed after he left. What I discovered over the next six days was nearly the full bounty of Europe packed into a succinct swath of mountains, lakes and Adriatic coastline, topped off by the gorgeous and entirely cosmopolitan capital of Ljubljana, where that river and those plazas mingle. It was the best of Europe without the worst of Europe — the hassle, the crush, the sinking feeling of watching something grand and authentic turned into a gaudy, unruly, costly theme park. Even in June, locals handily outnumbered visitors, and I walked the streets and drove the roads with the giddy, beaming sensation that I had stumbled onto a secret. I was not at all sure that I wanted to tell. Slovenia was once a republic in the federation of Yugoslavia, and it occupied the northwest corner of that former country, sharing a border with Austria to the north and Italy to the west. When Yugoslavia shattered more than a decade ago, it was other shards that drew notice, and not for happy reasons. Americans read plenty about Kosovo, Bosnia, Serbia and Macedonia, and what they learned hardly recommended travel to those places. But wealthier Slovenia, now an independent country, went its less turbulent way — its profile humble, its gentle rhythms undisturbed, its attractions largely unheralded beyond neighboring countries. What an oversight. There is little you might seek in Europe that Slovenia, which has only about two million people and covers an area roughly comparable in size to Wales or Israel, could not provide, and that it could not provide in a more pleasant, peaceful fashion. You want castles? Slovenia has hundreds of them, including Predjama Castle, near Postojna, less than an hour's drive from Ljubljana. Predjama is as dramatically situated as any castle you have ever seen — a white 16th-century fortress literally clinging to the side of a perfectly vertical cliff high in the mountains. Some friends and I found our way there along pristine roads so well marked, and so barren of traffic, that it would have taken a concerted effort to get lost. And we arrived to find most of the merely two dozen or so parking spaces empty and not a tour bus in sight. We sat alone at a picnic table that afforded the perfect viewpoint in silence broken only by wind and birdsong. You want hills tumbling to a royal blue sea? Slovenia can do that, too, even though the stretch of the Adriatic that belongs to it is only about 30 miles long. There are no truly wide, respectable beaches here, but there are old, labyrinthine cities like Piran, which has Venetian Gothic architecture and nestles close against the water. Because you are at the apex of the Adriatic, on the narrow curve where Italy becomes Slovenia and Slovenia then becomes Croatia, you can see across a carpet of blue to distant hills and, on a clear day like the one I was there, even more distant mountains, sometimes dusted with snow. 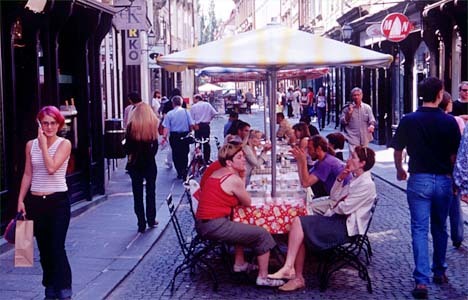 You want open-air cafes? Ljubljana has scores of them. The local residents fill them in the morning to drink cappuccino, in the evening to drink respectable (and cheap) Slovenian wine and tasty (and cheap) Slovenian beer, and at various points in between to eat their beloved gelato. You cannot walk more than 25 yards through the center of Ljubljana without running into yet another gelato stand, and late into the night the lines are a dozen-people long. You want shopping? Ljubljana again obliges, not with the high style of Paris or Rome but with its own delights, like mid range Italian shoes at low-range prices. There are no statistics to back this up, but I would wager that Ljubljana has more shoe stores per capita than any other city, and I admit that my friend Anne and I sampled a good many of them. A fun and funky pair of men's shoes runs between $40 and $75 — easily half the price that a similar pair would cost in the United States — and women's shoes run from $20 to $60. Yes, I snapped up one or two — O.K., four — pairs, allowing me to interact fully with local shopkeepers and take an accurate measure of the courtesy of Slovenes. They are as friendly and helpful as any people I have met. One of the benefits of traveling through a country that would like to have more tourists than it does is the warmth of your reception, and I was constantly startled and moved by the politeness I encountered. One night Anne, another friend and I were running late and called a restaurant on Lake Bled to see if it would keep its kitchen, which usually closed at 10 p.m., open just a bit longer than that. By the time we arrived, at 10:10 p.m., we were the only people there. No matter: they made and served us our meals at a leisurely pace, and when they overheard us say that the lighting was awfully bright, the chandeliers were instantly turned off. We dined in the softer light of the small fixtures along the walls and drank until after 1 a.m. When Anne and I asked the reception clerk at the hotel housing the restaurant if he could call a taxi to take us to our own hotel, which was about two miles away, we learned that it was too late. He promptly and eagerly went to fetch his own car, gave us a ride and accepted a tip only after we threatened to bludgeon him with recently purchased Italian footwear if he did not. In Ljubljana, I left the indoor light in my rented Volkswagen Passat on and awoke one morning to find the battery dead. An Avis representative came to my rescue in less than a half hour and graciously said nothing about my culpability in the unfortunate turn of events until the moment we were parting company. Even then, he seemed pained. "Not to blame you," he said in halting English. "Not to say anything bad. The lights — you must turn them off." The friendliness of Slovenes, many of whom speak at least a modicum of English, and the lack of tourists are only two of the reasons it is so pleasant to navigate Slovenia. It is one of the cleanest, most orderly , most efficient countries I have visited — the result, perhaps, of its Bavarian lineage. Slovenia was, for much of its recent history, ruled by the Hapsburg dynasty. The highways are immaculate, and they even have their own version of E-ZPass to speed Slovenes through the tolls. The grasses beside the roadways and the landscaping outside buildings are impeccably maintained; I never heard and saw more lawn mowers and weed whackers in my life. Well-organized, nicely stocked grocery stores are fairly easy to find, and nobody troubles himself too much with demanding that a visitor have Slovenian money at the ready. Taxi drivers were happy to accept American dollars — and to figure out a reasonable exchange rate on the spot. Automated teller machines with reliable links to American banks were everywhere. Although there are pleasant destinations throughout Slovenia, including a wine region in the northeast, I confined myself to the western band of the country, which is the most mountainous and prettiest, using Ljubljana as a base. From here, neither the highest Alpine peaks nor any of the towns on the coast — Piran, with its labyrinthlike alleys, has the most Old World charm — is more than a two-hour drive; staying in Ljubljana and taking day trips was a perfect way to keep from constantly packing and unpacking. You could easily do this for a week or longer without getting bored, but a stay of two weeks might buck up against the bounds of things to do. Only one of my jaunts proved disappointing, and that was a trip to the celebrated caves in Postojna, where tourists are corralled into a nearly two-hour adventure by train and on foot. Flitting past one iciclelike formation of limestone after another, I realized that while a creepy, craggy cave is almost always a good thing, you can indeed get too much of it. You are also not going to be wowed by the food you eat in Slovenia. Some of the local dishes — Karst ham, fried cheese with tartar sauce, more trout than you can shake a fishing pole at — are not about to appear on Manhattan menus, but you can, thanks to the country's proximity to Italy, almost always find decent pizza and passable pasta. I had a delicious spaghetti carbonara in a restaurant in Ljubljana named Prima Donna, which also captured the local tendency to get a bit carried away with the names of dishes. The theme there was divas, broadly interpreted. Appetizers included the Bette Davis and Brigitte Bardot salads and the Golda Meir vegetable soup, while entrees included the Maria Callas fusilli, the Gertrude Stein spaghetti, the Evita Perón risotto and the Frida Kahlo duck breasts. I kept looking for the Sharon Stone tenderloin. But do not let that tendency cast Ljubljana as provincial. A lively arts scene includes a local opera company, an orchestra and a music festival that runs all summer long and fills the streets with all manner of song. Walking to dinner one night, I passed a stage where Miriam Makeba was giving a free performance to no more than 100 people in a city park not unlike Washington Square in Greenwich Village. Walking back to my hotel two nights later, I had to push my way through thousands of Slovenes gathered to hear a local pop band in the same place. I did a lot of walking, and in Ljubljana, as in most European capitals, that was the most fun of all. Although not all of this relatively compact metropolis of about 330,000 people holds interest, the old part of the city, which lies at the center, does, and its most picturesque streets lie along the Ljubljanica River, which is latticed with stone bridges and hemmed by weeping willows. The buildings here include Renaissance, Secessionist and Art Nouveau masterpieces. If the interiors of the churches are not as grand and ornate as those elsewhere in Europe, the exteriors are sublime, and the palette of the old city — mustard yellow, pale green and terra-cotta red — is exceedingly easy on the eyes. Right near the nucleus of all this beauty is a raucous open-air market in Vodnikov Trg (or square). And Stari Trg, which is more of a street than a square, offers the pleasure of stepping back centuries in time only to discover up-to-the-minute shopping, including L'Occitane and Fossil stores, and sleek, minimalist bars that might have been designed by Ian Schrager. If you walk from Stari Trg up Gornji Trg and hang a left just before the Church of St. Florian, you will find a narrow, steep pathway up to Ljubljana Castle that offers a superb view of the city. The bad news is that you cannot fly direct to Ljubljana from any American city; you have to connect. But once you land, any inconveniences will be forgotten, because there are no more in store. Imagine a modern airport so compact and user-friendly that the rental car counter is just a few steps from the gate and your car is brought to the curb. And imagine a setting for the airport so picturesque that you find yourself tempted to sit for a few minutes at the sidewalk cafe out front, because there is so little bustle and it provides a sumptuous view of the foothills of the Alps. Slovenia is that charmed. Because it remains, for now, unspoiled, it guarantees that you will be. FRANK BRUNI is a White House correspondent for The Times. Village of Kranjska Gora and Triglav National Park. The catwalk over the Radovna River in the Vintgar Gorge. FEW minutes after the border guard on the train to Ljubljana handed back our passports, we spotted a long-legged, bluff-gray heron standing calmly in the shallows of the Savinja River in Slovenia. A few minutes after that, we caught our first glimpse of a ruined mountaintop castle, perched on an escarpment above the town of Celje. The prospects of unspoiled nature and the evocative remains of Central Europe's tangled history were what had drawn my wife, Zsofia, and me to this tiny, tidy Alpine republic, and it was already clear we would not be disappointed. Less than a day's drive north of its former sister states in the Yugoslav federation, Slovenia is a peaceful, prosperous country whose short history as a political entity is enriched by a distinct, centuries-old cultural heritage. The Slovenes, subsumed since the Middle Ages by neighboring multilingual, multiethnic empires, finally won their independence when they split with Yugoslavia after a 10-day war in 1991. With a week to see the northwest corner of the country, Zsofia and I, a couple of nature-starved New Yorkers, decided to explore the back roads by car, aiming to gorge ourselves on the greenery and crystal clear rivers about which the guides we had pored over at home had raved. We started our journey last August in Bled, the romantic resort 25 miles northwest of Ljubljana, where a Baroque church, the Church of the Assumption, seems to float on an island in the middle of the town's small aquamarine lake. After two days of relaxing, we set out in a rented Opel Astra for Triglav National Park, a 210,000-acre nature preserve in the Julian Alps dividing Italy and Slovenia. The dramatic terrain varies from craggy mountain peaks rising far above the tree line to erosion-carved river gorges hundreds of feet deep. We intended to explore the vertiginous Vrsic Pass inside the park and the many beauties hidden in the boundless forests that make Slovenia one of the greenest countries in Europe. Our first stop was the Vintgar Gorge, a milelong, 350-foot-deep ravine carved by the runoff from an Ice Age glacier. A wave of refreshingly cool, damp air met us as we entered the canyon, and we reached for extra shirts in the sudden chill. We made our way along a narrow wooden catwalk that hugged the sheer rock walls 15 feet above the blue-green Radovna River. Footbridges crisscrossed the rapids, and we paused to admire the giant, mossy rocks that leaned in over our heads and the fat brown trout that hung motionlessly in pools. A 40-minute walk brought us to a small waterfall at the southern end of the gorge, and we turned around eagerly for a second look on the return trip. Back in the Astra, we got on the highway for the half-hour drive to Kranjska Gora, a town hard by the Italian and Austrian borders and a jumping-off point for numerous nearby ski areas and the Vrsic Pass. On the way, we left the steady stream of traffic on the highway at the village of Mojstrana and entered the Vrata Valley. Turning onto an unpaved but well-maintained road where bicyclists were the only other traffic we saw, we entered the valley and began climbing the skirts of Slovenia's highest mountain, the 9,393-foot Mount Triglav. We were looking for signs to Pericnik Falls, on the Bistrica River. Pericnik, which we reached after a five-minute scramble up a steep, forested path, plunges 175 feet into a basin among huge boulders, raising a curtain of mist that drifts away into the forest. Another 10 minutes' drive along the increasingly steep forest road brought us to the Aljazev dom, an alpine hut that in clear weather offers an awe-inspiring view of Mount Triglav's sheer 5,000-foot north wall. We were not so lucky, though, and the mountain's face was hidden behind the rapidly thickening clouds that had been gathering throughout the morning. By the time we stopped for lunch at Jasna Lake, just above Kranjska Gora, the lake had turned slate green, the peaks above it were wreathed in dense, ragged swirls, and a steady rain was falling. The waiter at Gostisce Jasna, a restaurant with a pleasant terrace overlooking the lake, told us sunshine was forecast for the following day, so we decided to postpone our trip over the pass and retreat to Kranjska Gora. But this apparent setback turned out to be an advantage. We not only stumbled on the most delightful inn we found but, after the storm ended a couple of hours later, we also had a magnificent view of the Alpine peaks thrusting sharply into the blue, rain-washed air. In the four-room Gostilna Pri Martinu, run by a hospitable and energetic young woman, Janez Hrovat, we had a large, comfortable room with a curtained skylight and views of the nearby mountains into which we would be driving the next day, beyond the red tiled roofs of the village. The clouds lifted later that afternoon, so we made an unplanned side trip to check out the nearby source of the Sava Dolinka River, marked on our tourist map as a scenic stop. On the way, we turned off the main road from time to time to see tiny, charming villages with winding streets, whitewashed houses bedecked with flowers, the obligatory church on the hill and at least one hard-to-resist open-air cafe apiece. Readiness to dine alfresco at any opportunity is one manifestation of Slovenes' passion for the outdoors. Another is their veneration of the country's two major rivers, the Sava and the Soca, and the virtual enshrinement of their sources. The Sava Dolinka — one of two tributaries that form the Sava, Slovenia's longest river — rises in a marshy flat just a few kilometers from the border with Austria and Italy. After parking near a roadside cafe, we walked through the already darkening forest and out onto a boardwalk that shielded the fragile wetland. In the twilight, a bird's call echoed across the valley. Sunlight glinted on the rocky peaks as we made our second approach to Vrsic early the next morning. The narrow road zigzagged through 25 hairpin curves, paved incongruously with cobblestones, as it climbed 2,300 feet in less than a mile and a half to reach the saddle at 5,316 feet. It was hard to imagine that not so long ago this tranquil spot was the scene of fierce fighting described by Hemingway in "A Farewell to Arms." But standing at the tiny World War I cemetery, where troops from 17 nations are buried, and the simple Russian chapel honoring the prisoners of war who built the road over the pass — in the silence of the remote mountain pass — one could not ignore history's tangible presence. 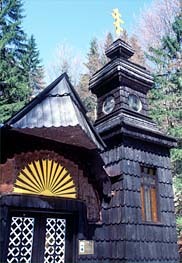 The Russian chapel dedicated to World War I prisoners who built the Vrsic Pass road. On the southwestern side of the pass, the road descends quickly toward the Trenta Valley and Slovenia's most beautiful river, the Soca, with its unfathomably green water. It is home to the Slovenes' beloved Soca trout. Found nowhere else, this spirited creature, which adorns the 1-tolar coin, can reach three feet in length and is a favorite of fly fishermen. After downshifting through nearly two dozen more hairpins, we turned off at the road leading to the source of the Soca. The 650-foot climb from the parking lot followed a short but casually harrowing trail that required clinging to a wire guideline while crossing a nearly vertical rock face. The dubious reward for this adventure was a close-up view, over the shoulders of a steady stream of fellow admirers, of the crevice through which the spring gushes from an underground lake to begin its trip to the Adriatic. Following along the Soca for a few minutes more, we stopped again at a small signpost marking the entrance to the Alpinum Juliana, a high-altitude botanical garden. Carrying an illustrated guidebook we bought at the garden entrance to help identify Triglav's native flowers, we strolled on the steep hillside paths of this outsized rock garden. But since we were there two months after the peak blooming season, we were lucky to spot even a few of the indigenous beauties, like the tiny, deep blue Zois' Bellflower — a symbol of Slovenia — and the exotic violet and orange Alpine toadflax, amid the grasses and edelweiss. By midafternoon, we arrived in Kobarid, the Caporetto of "A Farewell to Arms" and the center of the Isonzo Front, one of the deadliest theaters of World War I. The compact Kobarid Museum, which was awarded the Council of Europe Museum Prize for 1993, is a powerful reminder of the horrors of war in general and the Isonzo Front in particular. Display cases laid out on three floors of a renovated town house are full of weapons, stark photographs of life in the trenches, and soldiers' mundane personal effects like forks and canteens bear moving witness to the war cursed by soldiers on every side. Returning to the family-run Hotel Hvala, a pleasant, modern building on Kobarid's small main square, brought us back to the present. At dinner in the hotel's restaurant, the Topli Val, the other tables were filled with Italian families who had driven over the border for the simple, fresh and superbly prepared seafood, inexpensive by Western standards and agreeably presented. We started with delicately smoked Soca trout filets, followed by a seafood risotto and fish kebabs that were grilled to perfection. The sumptuous finale was prekmurska gibanica, a phyllo pastry stuffed with walnuts, apples, cottage cheese and poppy seeds — a shining example of the Slovenes' creatively filling desserts. After nearly a week on the twisting, narrow roads of Triglav, we were not altogether sorry to reach the four-lane freeway that led back to Ljubljana, where we turned in our rental car, closing the loop. Happy to be pedestrians again, we carried our bags up to a top-floor room in the city's splendid, turn-of-the-century Grand Hotel Union. As twilight fell, we found seats at a busy cafe by the river, where a half-liter pitcher of our favorite local white wine, beli pinot, helped smooth the transition from Slovenia's tranquil countryside back to our busy lives. 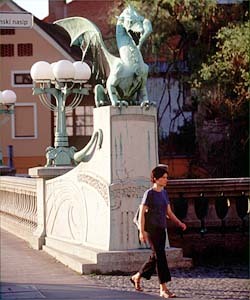 A dragon, Zmajski Most, symbol of Ljubljana, perches on a bridge. ALAN KRAUSS is an editor in the business section of The Times. The prettiest regions of Slovenia have distinct seasons, so visitors should time their trips according to their tastes. In winter, there is plenty of snow and a number of good ski runs in the Alps. Spring and fall are pleasant, while July and August are Slovenia's most crowded months (though the crush of tourists is never like that encountered in Florence or Barcelona). United States citizens need a valid passport but not a visa. The Lonely Planet series of travel books publishes a particularly good guide to Slovenia. For further information, and suggestions of travel agencies that can help with hotels, rental cars and tours, contact the Slovenian Tourist Office, 345 East 12th Street, New York, N.Y. 10003; (212) 358-9686, fax (212) 358-9025; http://www.slovenia-tourism.si; mail or phone inquiries only. There are no direct commercial flights from the United States to Slovenia. Travelers are most likely to be routed through London, Munich or Frankfurt, Zurich, Paris or Vienna. Although the second leg of the flight, from another European capital to Ljubljana, is most likely to be on Adria Airways, the entire ticket can be booked through the airline taking the passenger to and from Europe. Both American Airlines and British Airways have competitive fares. A round trip on one of these carriers this summer, purchased well in advance, runs about $1,050; that price goes down by several hundred dollars after Labor Day or after Sept. 15, depending on the carrier. Train travel into and out of Slovenia is not as direct and convenient as it is in many other parts of Europe. A better alternative might be driving: Ljubljana is only about 180 miles from Vienna and 115 miles from Venice. By far the fastest and most efficient way to get around Slovenia is by car. Major American car rental agencies — including Hertz, Avis and National — have counters both at the airport outside Ljubljana and in the city, and reservations can be made through the companies' American offices. Grand Hotel Union, Miklosiceva Cesta 1, Ljubljana; (386-1) 308-1270, fax (386-1) 308-1015. There are about 230 rooms in this gorgeous Art Nouveau building, built in 1905. And the location, amid a cluster of similar architectural masterpieces in the older part of the city, is unbeatable. Rates: about $135 a night (at about 240 tolars to the dollar); prices can fluctuate, dropping in winter. Hotel Slon Best Western, Slovenska Cesta 34, Ljubljana; (800) 937-8376 for central reservations or (386-1) 470-1100, fax (386-1) 251-7164. This 171-room hotel also has a terrific location, on a busy, modern block along the periphery of the old city and near dozens of stores. It is several grades above the typical American Best Western, with very comfortable, modern rooms and, as a bonus, a row of parking spaces that are often available free. Rates: $103 to $118 a night in summer, including breakfast; sometimes less through corporate or travel agency discounts. Lev Inter-Continental, Vosnjakova 1, Ljubljana; (800) 327-0200 for central reservations or (386-1) 433-2155, fax (386-1) 434- 3350. With 173-rooms, this is probably the most contemporary and upscale of Ljubljana's hotels, but it is situated a few blocks farther from the old city, in a more nondescript patch of the city's business center. Rooms are about $175 in the summer, less with special summer rates and in other seasons.